If you are looking for the services of a professional curtain maker in Merseyside, we are proud to be able to offer assistance. There is so much more to designing and manufacturing the perfect curtains. It is not just a case of getting them to hang to the floor but entails having the material hang and drape beautifully and letting the curtains themselves make a bold statement in your home. We design the curtains to be a prominent part of the decor of the room so that they play as big a part in the look of the room as the furniture. They are, after all, a large part of the surface area of the room. When you are looking to improve the style of your home you need an interior designer as choosing the colours and materials needs a professional eye. In Merseyside, professional curtain maker services can make the difference between something that blocks out the light at the window and something that is a piece of art in your home. Well designed and make curtains can be the glory of your room and some are breathtakingly beautiful both in material and shape. 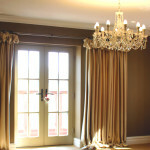 We welcome you to use the services of a professional curtain maker in Merseyside. For more details about our professional curtain maker, contact Millan Interiors today. We also invite you to visit our showroom to see the wonderful array of stunning designer items we can provide for your stylish home. Our designers have many years of experience and spend time with each client to be able to match the design style to the personality of the customer. You home should show who you are as a person as well as being stunning to look at and practical to live in. Debbie Peers has over 15 years in the design business and puts her accumulated knowledge to use in providing a stylish make over for your home. Adele Headley has a BA Hons degree in interior design and a background in lighting design. We offer honest advice of all aspects of style and design and want you to be delighted with the changes to your home.